Music from the ancient Celtic lands--all-instrumental music on early music and traditional folk instruments performed by members of Ensemble Galilei and guests. 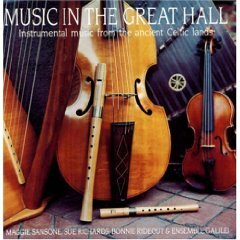 Includes: Maggie Sansoneon hammered dulcimer, Sue Richards on Celtic harp, Bonnie Rideout on Scottish fiddle and Carolyn Surrick on viola da gamba. Recorded in the Great Hall of St. John's College in Annapolis, Maryland, an acoustic wonder that captures the warmth and richness of the musical instruments. This CD presents members of Ensemble Galilei and guest musicians that highlights their innovative use of early music and Celtic tunes. Hear Irish airs from the Bunting and O'Carolan Collections, jigs and reels from the Isle of Man and 15th-century Welsh tunes and more! (55:56 minutes) . "Offers a variety that will lull you into revelry one moment, make you tap your feet the next, and cheer your day no matter."